Twitching is a method of birding by which birdwatchers follow tips and sighting reports in order to see rare birds. Twitchers might consider themselves birders, or they might not. Not all birders are twitchers, either. But twitching is something special and twitchers do improve their odds with practice. 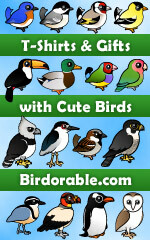 Here's a fun design for rare bird twitchers who are Practiced in the Art of Twitchcraft. To order by phone, call toll-free at 1-877-809-1659 from Monday - Saturday 9:00am - 9:00pm EST. You'll need to note the Product Number 030-220106136 to make your order.